I fully support the Hazare’s Agitation. I think the only real patriot must support the movement. the politicians can’t support the movement. Carry on Mr. Hazare, we are all with you. Many people of India think that our Prime Minister Dr Monmohan Singh is an honest man whole of the ministers. if so he is, it is the proper time to prove his honesty himself. Govt can split the movement. Deshe SAMMO pratistha korte hole,prothome ja korte habe ta holo-durnitibachder chirnito kore tader kathor shasir byabotha kora.ANNA HAZARE-r aandolonke aami o aamra samorthan korchhi,korbo. Mr.ANNA HAZARE, We are with you……. The idealism of Gandhiji can’t be dilute with our corruption. We need him so Anna Hazare. 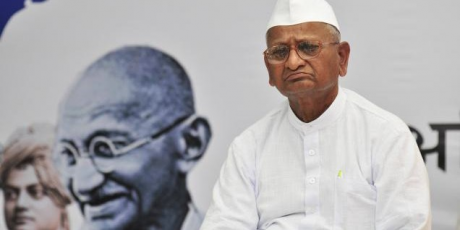 Respected Anna-ji you go ahead, we are with you in hazare hazare (in thousands) !!! Politicians are corrupted,so Non-Politicians need more. We are with Anna Hazare.